Let me introduce ECP and TLM-PSD. What makes the advent of ECP? Porous materials have been widely used in various scientific and industrial applications. They have attracted special concerns as electrodes used in electrochemical energy storage devices such as electrochemical capacitors, batteries and fuel cells. Understanding of the microstructure of a porous electrode is essential since the structure affects the electrochemical properties of the electrode and thus the performance of the device. Various techniques are available to analyze the microstructure of porous materials: gas adsorption, He pycnometry, mercury intrusion porosimetry, SEM, X-ray diffraction and so on. Each technique has its own merits and demerits. For example, the nitrogen adsorption technique is difficult to detect pores larger than 100 nm. Mercury porosimetry is inapplicable to soft materials since its operation at high pressure leads to the deformation of pore structure. Most of all, they are non in situ techniques so that measured pores or surfaces may not be identical to those accessible to electrolyte ions. We have developed a novel analytical method, electrochemical porosimetry, by which the geometric parameters meaningful in electrochemical systems can be obtained in situ. This method can analyze microstructures of a wide spectrum of porous materials used in various fields. The methodology is based on the transmission line model with pore size distribution (TLM-PSD) that relates electrochemical impedance data with microstructural information. Pore length, as well as pore size distribution, can be obtained by fitting the TLM-PSD to the experimental impedance data of a porous electrode. This geometric information was validated for the microporous, mesoporous and macroporous samples by comparing with the data obtained from conventional porosimetry. Also, the electrochemical porosimetry could be used as a nondestructive probe to investigate the construction of electrochemical devices. Just click the below button to download it! The [TLM-PSD] is the program that can extract the useful information from electrochemical impedance data by fitting the data with our unique model TLM-PSD (Transmission Line Model with Pore Size Distribution) via CNLS (Complex Nonlinear Least Square) fitting procedure. 1. Organization Map: This section shows the organization of [TLM-PSD]. Double click of a section buttons calls the section of your interest on foreground. 2. Information part: Information about samples is registered here. 3. Impedance(Z) part: This part consists of two datasheets and one graph sheet. Z: Exp. 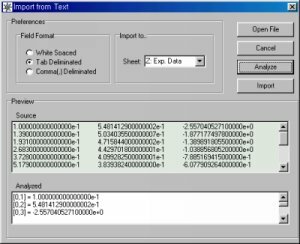 DataSheet have experimental impedance data by Import or direct input while simulation data or the results to fit the experimental data with a model are included in Z: Sim./Fitting DataSheet. 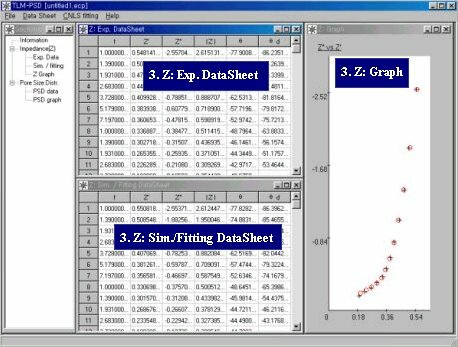 Z: Graph sheet draws Nyquist and Bode plots automatically using the data in above datasheets. 4. 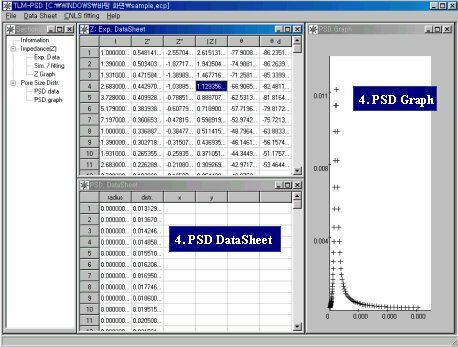 PSD (Pore Size Distribution) part: There are one datasheet and one graph sheet. 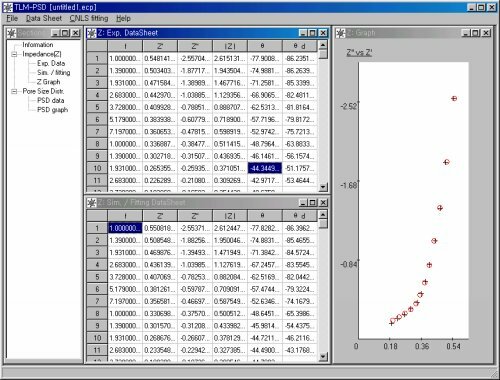 PSD data is a datasheet including data of pore size distribution calculated from our TLM-PSD models. The corresoponding graphs are shown in PSD graph. Here is the easiest way you are accustomed to [TLM-PSD]. 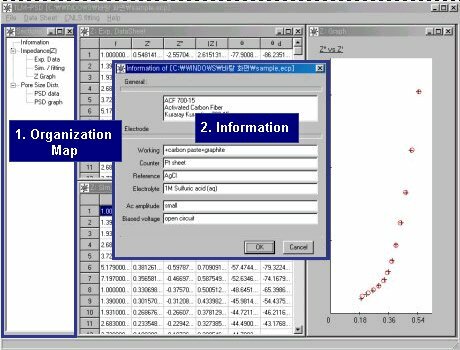 To analyze impedance data and extract useful information from the data, the experimental impedance data should be loaded on or inputed into Z: Exp. DataSheet as the first step. Let's enjoy [TLM-PSD] surfing by analyzing a sample file. Before use of Version 1.0 of [TLM-PSD], the experimental data should be massaged so that there remains only characteristics of porous electrodes in absence of faradaic reactions. The Nyquist plot (minus imaginary parts vs. real parts of impedance) characteristic of porous electrodes in non-faradaic reactions shows a 45-degree phase angle at high frequencies and an inclined curve with a phase angle between 45 and 90 degrees at low frequencies. 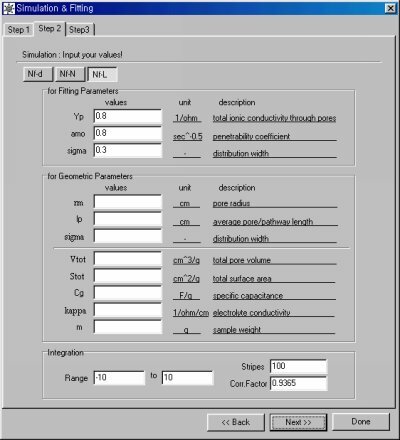 To obtain it, you should subtract the rest part from raw impedance data by using other programs such as Prof. Boukamp's Equivcrt (supplied by PARC) and your ingenuity. Click "Datasheet/Import" in menu bar. Click "Open File" in window to select the data file (sample_ACF.txt). Click "Analyze" and then "Import". -You could see the data loaded on Experimental DataSheet. delta: Nf-d : the conventional model which consider only the in-a-pore dispersion. That is to say, the pore size distribution (PSD) is assumed to be delta function (Only one pore dimension exists.). Normal: Nf-N : PSD is assumed to be normal distribution. Lorentzian: Nf-N : PSD is assumed to be Lorentzian distribution. Select "Lorentzian" and "Next" in window. Input parameter values for fitting parameters (Yp, amo, s). -These values are used as an initial guess for fitting or as just parameter values in the case of simulation. If you want to get the pore size distribution, you should know several additional information (Vtot, Stot, Cg, kappa, m) and give the values to [TLM-PSD]. -The default guess for fitting parameters are set to 0.8,0.8,0.3 for (Yp, amo, s). These values would lead you to good convergence in our experience. -You could see the process of fitting in below window. If you want to see the results of fitting values, click "Back". After all is done, click "Done". 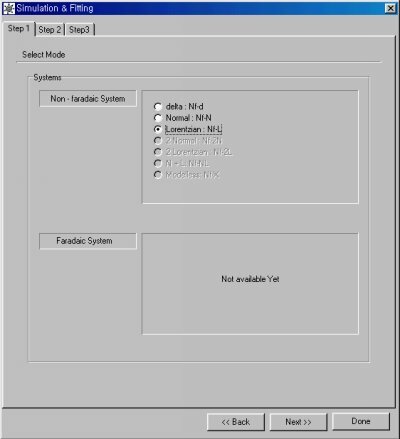 -[Simulation & Fitting] window disappears. Then, You can see the experimental data and fitting data in graph section. Moreover, the pore size distribution can be obtained when several information in Step 2 is filled. Electrically Based Microstructural Characterization III (Editors: R.A. Gerhardt, A. Washabaugh, M.A. Alim, G.M. Choi)- MRS Proceedings Volume 699, R7.7. (2002). Click & enjoy my talks about TLM-PSD and ECP in Korean!